Interesting. I would not have predicted either. I'm fully aware that my aversion to carbon fiber isn't rooted in science; for me it's an irrational phobia that it will somehow collapse on me. USA Cycling releases tech articles? All the more reason to track stand. There's is some truth to the carbon 'road' 'clincher' tubeless wheel ~ high pressure. If one wants to be the experimenter, that's the price and risk. Wheel makers are in continuous evolution. The problem does not reflect road tubular carbon, nor MTB carbon clincher, high volume low pressure. Oh that nasty carbon fiber! I can see both as possible, based on design issues and unexpected stresses. Well to be fair, based on observation and the fact that I've never heard either of the "issues" before. You would think that if they were real problems that they would be talked about on the forums quite a bit. I've never seen anything like either issue mentioned. Carbon is waaaaay too strong for a limp leg resting on it to break it. That just sounds crazy. There is this thread about a failed Dura Ace rim. Who has filled alloy rim cracks with JB Weld (metal epoxy)? Obviously one can't read too much into a single anecdote. And, the rim was apparently purchased used. However, I do wonder if there is, in fact, a mechanism of risk to a rim with tubeless (and tubeless ready profile rims). In general, riding shouldn't add a lot of extra stress. Low pressures, same outward pressure, etc. Bead seating, however, could be a problem. Pump the wheel up to 120 PSI or so. More? Then "pop", hitting the rim with a high dynamic load. And, of course, a push for lighter and lighter builds. Perhaps also moving to larger tires. So, 28mm? Larger with MTBs? One thinks of pressure as a single measurement, but there is a tearing force on a balloon dependent on the size. So, the oversized tires would put more stress on the rim, especially if inflated to the same pressure, or inflated to a high pressure to seat the beads. I can't say about the frames. Growing pains? My foray into Carbon Fiber has been with a vintage Carbon Fiber frame that I think uses homogeneous thickness, and isn't affected by that problem. I think that the reason for cracked rims could be more behavioral than scientific. My guess is that most early adopters of road tubeless were MTB converts or cyclocross racers. Both try to run as low as possible pressures (one of the promises of tubeless is the ability to run lower pressures without pinch flats), which will inevitably lead to more rim hits. I can certainly see rim hits leading to more rim cracking. Don't know much about either. I've only wrecked a Technium, and the bonds held. The rest of the front did not fare well, and the front wheel pretty much blew up. I've seen a couple of Kestrels crack on the top tube, no idea why, but it wasn't riding. I saw one hit a guard rail and break behind the head tube. Rider was fine (over the guard rail). As far as tubeless, I have one set, and have not got the nerve to go commando with it. The cross riders I know say they're great, but they're running a lot lower pressure. I rebuilt a Madone so a lady could ride across the country. I put liners in the GatorSkins and tubes that were extra thick on the face. She had one flat. She said those riding tubeless had constant problems. I attribute some of that to not having a wrench along (but they did have a chef). It will be a while until I can get my head around putting 2oz of liquid in a tire and just riding off on it. That's all. Purely psychological, and since I'm pretty much nuts, well, there you go. They must be tracking something, certainly not PED use. The Carbon problems... the age of the Colin Chapman bike. Carbon frames forks and components have been in production for over 30 years and some goofball mechanic discovered the material's Achilles heel: brushing your thigh against the top tube. Last edited by radroad; 02-05-19 at 06:02 PM. Again, no. There is a big difference between clamping a carbon and resting on it. And who the heck supports their entire body weight on one leg, on a top tube? Sorry, but nope. I'm willing to bet your guy is seeing damage from handlebars hitting the top tube, not from resting a leg on it. I've noticed some sunscreens can be pretty corrosive, enough to damage paint. That sounds like a more reasonable explanation for TT damage to me. Carbon frames forks and components have been in production for over 30 years and some goofball mechanic discovered the material's Achilles heel: bruising your thigh against the top tube. I spent my career doing design engineering in the aviation industry. If you do not trust carbon fiber, you better not get on a modern aircraft. It has been used for a few decades now and is often used in flight controls and other critical structure and components. There is a difference in that the aviation industry has much higher standards for analysis and testing, and required in service inspections that the bicycle industry doesn't. This could account for early adopter failures like early carbon road wheels. However, I would think any of the established bicycle manufacturers have their design and manufacturing procedures down pretty well. I have been riding carbon fiber mountain bikes since 2013. I am not a free stile rider, but I use them for what hey are designed to do and (unfortunately) have had the odd spill and have seen no signioficant damage, and I inspect the bike closely every time I wash it. That being said, I do love my steel bikes too, and think it is a great material. I personally had a carbon frame crack on the top tube during my first Belgian Waffle Ride. 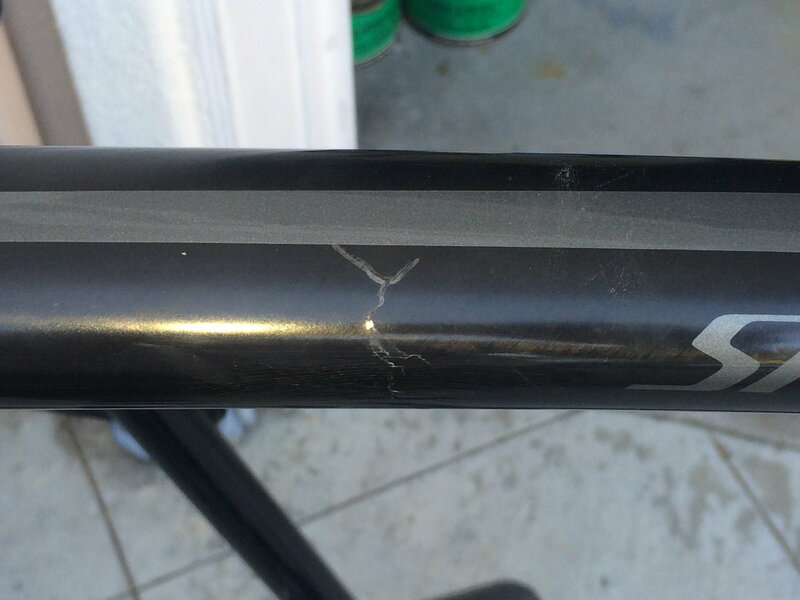 It cracked in the place where I've seen guys sitting on it, The manufacturer replaced the frame in due time, but I was told by someone at the shop not to rest on the top tube of carbon bikes because that is where the manufacturers can save some weight. This was about four years ago, and led me to start buying steel bikes for my more adventurous rides. I've attached a photo of the crack. All the inner tubes I've ever seen are not pressure vessels. I.e. they cannot contain any appreciable pressure on their own. 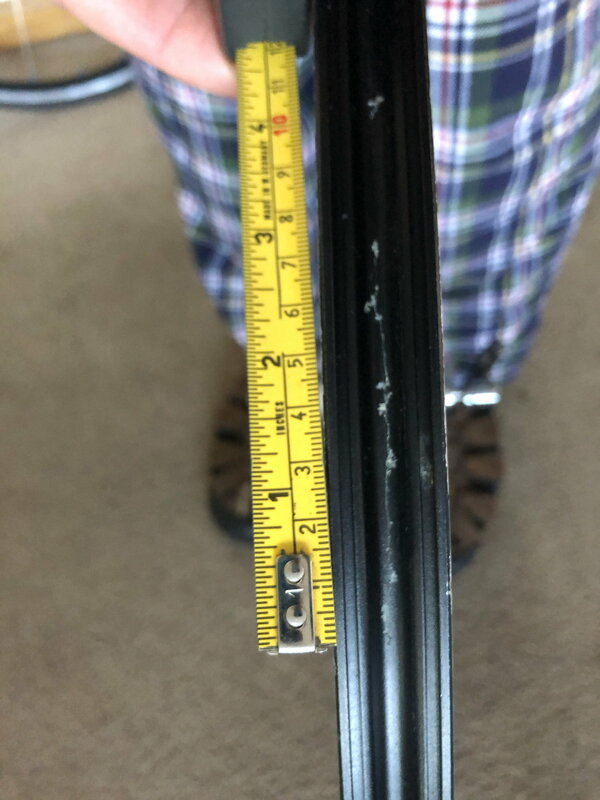 Therefore I'm skeptical that inner tubes are somehow taking any appreciable amount of the hoop stress in a pressurized tire/tube/rim assembly.